I remember the Garden Balsam, before you pick it up, has human eyes and seems to be somewhat sentient, even turning towards Twinsen and extending its leaves like arms when he appears near it. 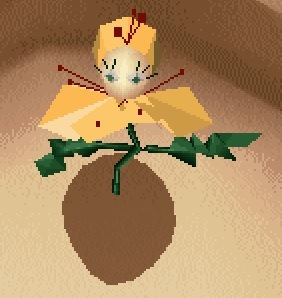 However, when you pick it up, it becomes a normal flower in your inventory. I always found it strange... did you also notice that? I cannot find a picture of the flower before picking it up, and the LPs I saw go too fast before we get a good look at the flower. I never noticed that detail in all the times I played LBA2. I simply picked up the flower without stopping to fix on its details. We're still discovering new things about LBA. Amazing. So, someone said that you can give the flower to the Quetch in love with the Pharmacist, so that he'll offer it to her and then they have a date... is it true or not? No, he doesn't react to the flower at all, which wouldn't even make sense since giving away the only flower would softlock the game. However, you can regrow the flower with the magic horn, no? It doesn't regrow completely it creates a new stem. Ah, ok. Forgot about that.